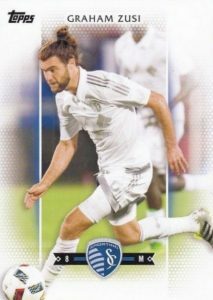 Featuring a considerable design overhaul from last year, 2017 Topps MLS Major League Soccer maintains the standard format of two autographs and one jumbo relic per hobby box. 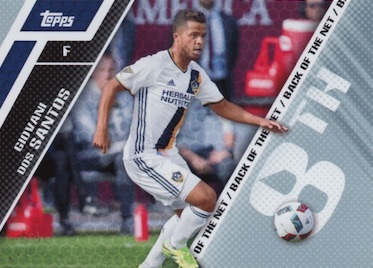 Offering stars of the league as well as debut cards for Atlanta United FC and Minnesota United FC, the 2017 Topps MLS base design showcases a noticeable update with rounded, white edges and central lines used to highlight the player. Parallels include Blue (#'d), Orange (#/25), and Black (1/1), and there are also limited base Image Variations for select players. Borrowing the main layout, the Base Autographs insert features a primary version along with Orange (#'d), Red (#/10) and Black (1/1) parallels. 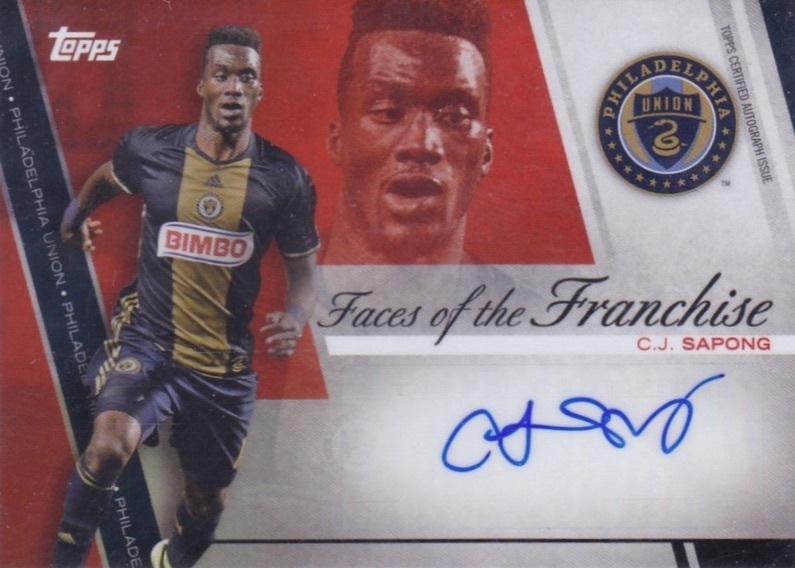 Other signed options in 2017 Topps MLS Major League Soccer include Faces of the Franchise Autographs for a team's top player. These have Red (#/10) and Black (1/1) parallels. 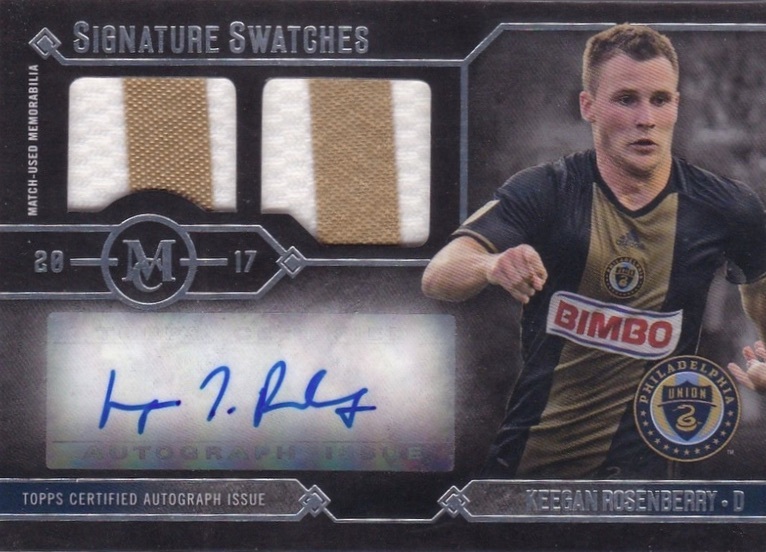 Museum Collection MLS Autograph Relics (#'d) showcases the Topps MC Baseball design with a limited dual relic signature. Falling one per hobby box, Jumbo Relics inserts contain an oversized jersey piece with the added possibility of numbered multi-color piece and patch parallels. 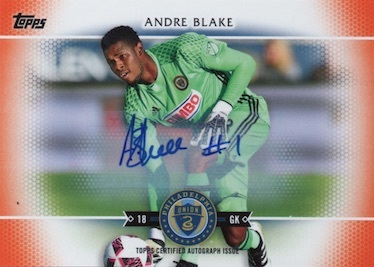 A trio of new inserts close out 2017 Topps MLS Major League Soccer. Back of the Net looks to the elite scorers while Give and Go focuses on the top team duos with a double-sided card. 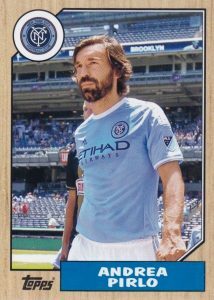 Honoring the 1987 Topps Baseball design, Throwback Topps puts current MLS stars on the '80s classic as it celebrates its 30th anniversary. Each insert comes as Red (#'d) and Black (1/1) parallels. Throwback also has a serial numbered Autograph version. 190 cards. Shop for base sets on eBay. PARALLEL CARDS: Blue #/99, Orange #/25, Red #/10, Black 1/1. Most base cards and variations have different card numbers.Shop on eBay. PARALLEL CARDS: Orange #/25, Red #/10, Black 1/1. 48 cards. Serial numbered #/500 or less. Shop on eBay. PARALLEL CARDS: Orange #/35, Red #/10, Black 1/1. PARALLEL CARDS: Red #/10, Black 1/1. 47 cards. Serial numbered #/60 or less. PARALLEL CARDS: Red #/15, Black 1/1. 18 cards. Serial Numbered #/35 or less. Shop on eBay. PARALLEL CARDS: Red #/5, Black 1/1. 14 cards. Serial Numbered #/25. Shop on eBay. Good: All hits are numbered, Throwback inserts stick out in a good way, Museum Collection adds quality. Bad: Signers list is not the strongest, vanilla base design, sticker autographs. 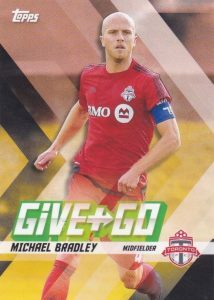 The Bottom Line: While Museum Collection is a nice addition, the flagship MLS set still struggles to justify the cost. Given the likely price drop, this is one that is better to wait out. 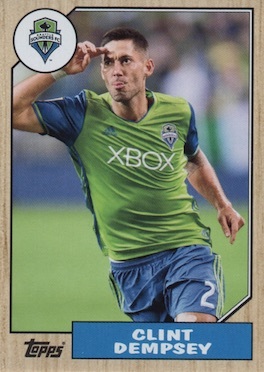 Reversing course from the more wild look last year, the 2017 Topps MLS Major League Soccer base set is, in a word, underwhelming. 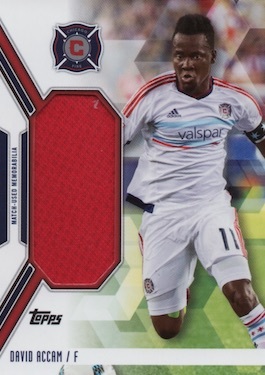 Heavy on white and anchored with vertical lines that break the card into an odd, three-box layout, I struggle with it. Despite the more traditional look, which includes the players’ full names this time, it’s bland and gets really repetitive. On the other hand, it makes the parallels much more appealing in my eyes, because the flash of color is captivating when set against all that white. Going with a fresh slate of inserts, Back of the Net is an interesting idea although I would have preferred their goal total prominently featured rather than their league scoring rank. I also liked Throwback (aka 1987 Topps), mainly for the contrast, but this is already too common from Topps to repackage old designs. Give + Go is another insert that caught my eye thanks to the colors. Bringing a touch of quality to the set, Museum Collection is a new addition that is likely familiar to anyone who has seen the brand used for other sports. These are pretty rare so they are not quite as much of a selling point. The fact is that MLS sets will never have a huge following and the way you offset this is to help the product stand out. One thing that would be a great switch is to have only on-card autographs. 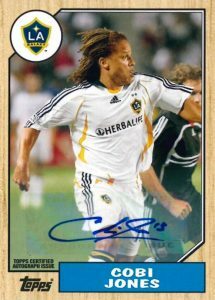 I get they are more difficult to acquire but Topps has an MLS team in their backyard, which means most other teams roll through there at some point. Another thing to do would be to come up with captivating designs. Topps is clearly open to tinkering and I do appreciate that they did not just carry over the flagship MLB design, as that would have been the easy thing to do. Although previous years saw an increase in top signers, I feel the 2017 autograph checklist takes a step back. 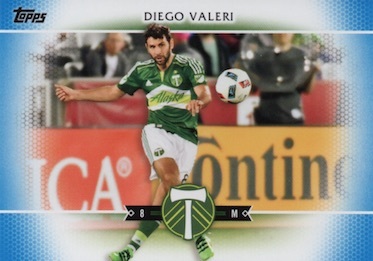 Other than Giovinco, Pirlo, Tim Howard and a few of the young guys, there is not as much to look forward to here. Compounding that is the fact that base autographs are as plentiful as 500 copies for the low-level names and very rare for the top guys. From a monetary standpoint, value is tough. Priced around $70-80 at the time of this review, this is not really the product to buy expecting a strong ROI. 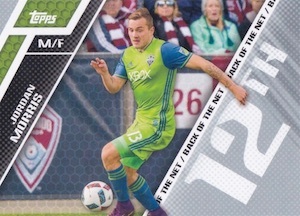 Without many big-value hits, 2017 Topps MLS is better suited to collectors who are looking for a moderate MLS release and aren’t as concerned with the return. Obviously, this is not a great thing for value. 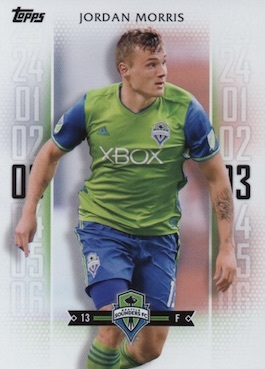 I appreciated 2017 Topps MLS most for the variety in the packs. Because the base set design blended together, the cards that were different stood out much more. I admit that this was not the most exciting soccer set to open, but there was still some fun stuff in there. Hopefully Topps keeps messing with the format and the designs, and can bring future releases to the next level. product wise i like the white background cards and the base card checklist. The auto checklist leaves a lot to be desired, with a fraction of the big names of their 2016 products. The relics are nice, and the numbered to /15 relics add some excitement. 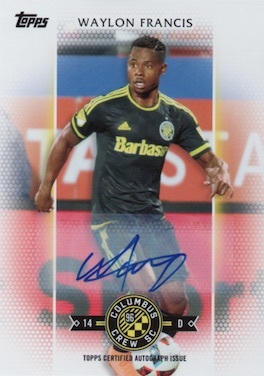 I just wish topps would take the MLS cards more seriously…. I agree with Doug S’s review. MLS is poised for takeoff. The fanbase is growing and soccer appears to be solidifying its foothold in what is still a 3 (debatable 4) sport country. The purchasing mode for me is wait for the next year’s boxes to drop and then buy them. Most of the autos aren’t that different from years past. 4) GET Schwansteiger to auto! 5) More different relics: goalie gloves, captain armbands, etc.